O Sacrament most holy! O Sacrament divine! All praise and all thanksgiving, be every moment Thine! O my beloved Jesus, O God, Who hast loved men with such exceeding love, what more canst Thou do to make Thyself loved by these ungrateful men? Oh, if men loved Thee, all the churches would be continually filled with people prostrate on the ground, adoring and thanking Thee, and burning with love for Thee at seeing Thee with the eyes of faith hidden in a tabernacle. But no, men, forgetful of Thee and of Thy love, are ready enough to court a man from whom they hope to gain some miserable advantage, whilst Thou, O my Lord, Thou remainest there alone and abandoned by all. Oh, that I could by my devotion make reparation for such ingratitude! I am sorry that I also have hitherto been like them, careless and ungrateful. But for the future I will not be so any longer. If at one time I have despised Thee, I now desire nothing but to love Thee. O my Jesus, Thou art my Love and my only Good, "my God and my all!" A partial indulgence is granted for visits to the Blessed Sacrament to adore It (plenary if for at least one half an hour). Pious Invocations are granted a partial indulgence. Heavenly Father, in your wisdom you have called certain women and men to a life of special consecration so that in prayerful observance of a lifestyle of poverty, chaste celibacy and obedience, they might be witnesses to us that as St. Paul says, "our true citizenship is in heaven." Give them, Lord, the grace of joy and perseverance in their holy vocation. We ask this through Christ, our Lord. Amen. Catholic Marketville carries an extensive selection of Catholic books and bibles on faith covering a wide range of topics. Learn about Catholicism through the most prolific Christian thinkers including Saint Francis de Sales, Saint Francis of Assisi, Saint Therese and, of course, we have the very best and most authoritative books on the teachings of Jesus Christ. We carry leather-bound Christian bibles in large print, as well as illustrated bibles for Christians of all ages in search of easy to understand ways to expand the knowledge and faith. Our coloring books cover important lessons and are great for parties, play dates, and Sunday school. Give the gift of faith this year with our Catholic bibles and books dedicated to exploring everything from parenting in today’s world to the heroes of the old testament. Shop now to take advantage of our affordable prices and fast shipping or give us a call at 647-430-3403 for help finding the right books for you and your family. The Eucharist nourishes our life of faith. Its signs are the bread and wine we receive—the Body and Blood of Christ. The act by which we receive the Holy Eucharist is called Holy Communion. Confirmation seals our life of faith in Jesus. Its signs are the laying on of hands on a person’s head, most often by a bishop, and the anointing with oil. Like Baptism, Confirmation is received only once. Its purpose is to perfect in us that which was begun in Baptism. We might say—in a sense—that we are baptized in order to be confirmed. Enrich your faith. Enhance your home. Give gifts that inspire. Catholic Marketville is an all-in-one Catholic bookstore and gift shop. You'll find everything you need to supply your home with Catholic artwork and statues, Holy Water, bibles, sacraments, and devotional items of all kinds. Our selection includes gifts and decorations to turn every Christian holiday from Communion to Christmas into an unforgettable religious experience. We have the most unique baptism and confirmation gifts, as well as fun Christian coloring books and games for kids, coffee and travel mugs, inspirational tote bags, jewelry, and more all designed to enhance your Catholic faith. 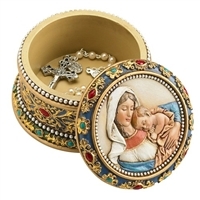 Devotional gifts are a great way to share your Catholic faith with friends and family while supporting the dedicated artisans who create these exceptional offerings. We want our Catholic and Christian products to become cherished mementos your family will look upon with fond memories and be blessed to pass along with love and joy. Shop our selection, give us a call at 647-430-3403.